We are delighted that we have been recognised by top botanist David Bellamy for our commitment to sustaining and encouraging wildlife at York House Holiday Park and Abbots Green Luxury Lodges. For the 15th year running, we have retained a gold David Bellamy Conservation Award for the “many positive environmental activities” and all the “wonderful projects” that have been put in place on our site to help protect wildlife. York House has participated every year for nearly two decades in the David Bellamy Conservation Award Scheme, which champions holiday parks that are working to protect and enhance Britain’s environment. The scheme’s assessors visit sites across the UK to carry out an in-depth wildlife audit. In her report, the assessor highlighted various environmentally-friendly initiatives at York House and our neighbouring Abbots Green site. This includes a new water feature and ornamental grasses, spurges and shrubs alongside the stream and ponds, as well as a new herbaceous border which was described as “absolutely wonderful and a credit to the grounds team”. The assessor also noted that “energy and water conservation are taken seriously” and there is “a good balance of more formal areas around the holiday homes and wild areas around the park boundary”. 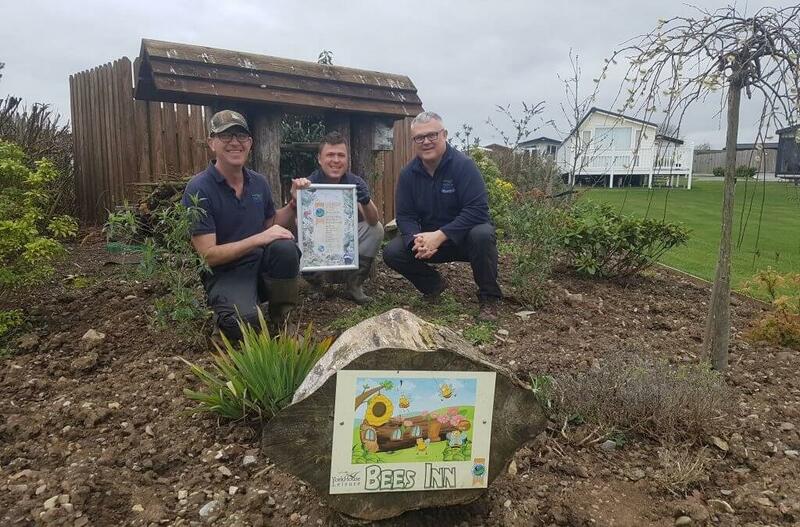 We also retained York House’s status as a Honey Bee Friendly site, with the park’s managers John and Sam Reay, and groundsmen including Paul Sorbie, praised for their efforts in encouraging bees to the site. In addition, they received a Wildflower Habitat badge for features such as “a magnificent 1422.5m of native hedge”. John said: “We’re delighted to once again receive the David Bellamy Conservation Award in recognition of our efforts and commitment to protecting and enhancing the environment here at York House and Abbots Green. We are so grateful for the hard work of our wonderful staff, particularly our groundsmen, in keeping our park as wildlife-friendly as possible. The 23-acre site of York House Holiday Park and Abbots Green Luxury Lodges is home to a variety of wildlife including rabbits, squirrels, stouts, hedgehogs, bats and a visiting fox. Birds include chaffinches, sparrows, blackbirds, thrushes, pheasants and swifts, while barn owls can be heard and sometimes seen at night. Ducks and mallards love to bathe in the new water feature on Bishops Brook. The park’s ponds and beck also provide habitat for aquatic animals and birds including grayfish, bull heads, trout and water voles, while a resident pair of moor hen have made Abbots Green their home for the past five years, producing at least two sets of chicks annually. The same pond is also home to carp and is visited by Canada geese and herons.